Hello to all! We will be hosting three Women Build groups this week! * We are excited to host teams from Cross Insurance Agency, Senator Hinds office, and Team Women Bosses. This coming week we will be working from scaffolds and ladders to frame and sheath the second floor. We will also be building the stairway, and begin second floor wall construction. We are excited to make this house into a tall, beautiful home, step by step. 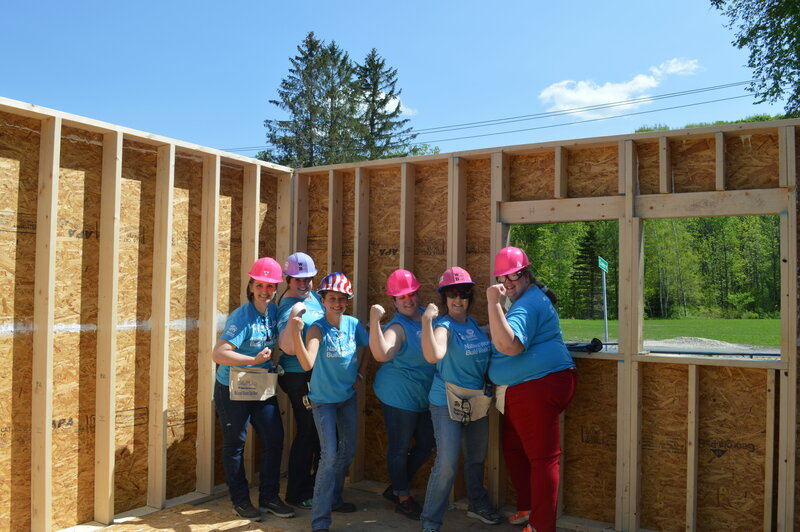 Last Wednesday we hosted a jubilant team from Greylock Federal Credit Union who put up two walls while they were with us! 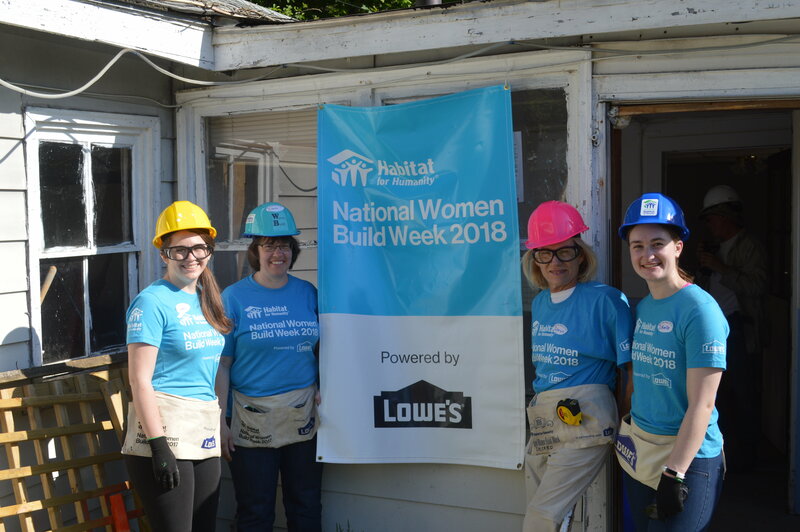 On Thursday, we had a small but mighty team of individual women builders led by Cheryl Zaccaro, and Beth and Noelle Frederick. We watched as these teams finished raising the four first floor walls and began to install the interior walls in the home. It has been inspiring to watch how quickly and efficiently our Women Build teams have been building this home for Courtney and her children. 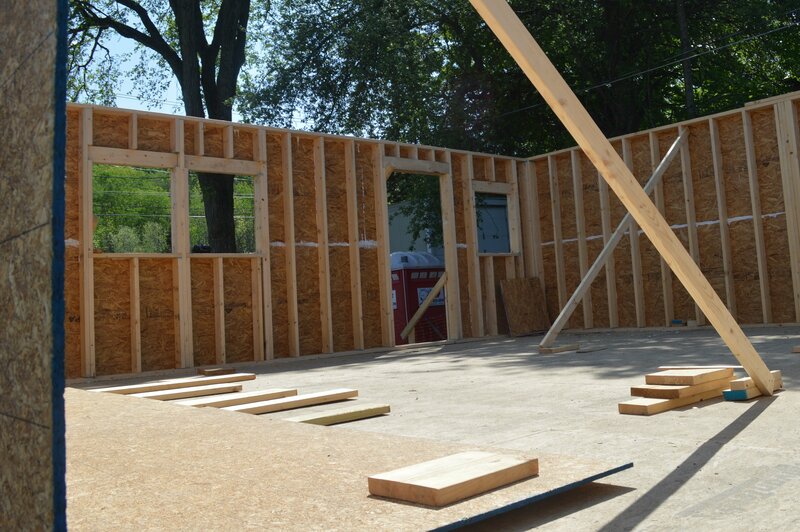 "Last week, we began with two exterior first-floor walls and ended our week with all four walls and interior partitions. Additionally, the initial stages of the second floor framing are now underway with the rim joist and girder nearly complete. The amount of work being accomplished in a day has been breathtaking and inspiring". 1) "Dimensional lumber" is a term used in North America for lumber that is finished/planed and cut to standardized width and depth specified in inches. 2) In the U.K. and Australia, "timber" is a term also used for boards, whereas the product of timber cut into boards is referred to as lumber in the United States and Canada. 3) The United States produces about one-quarter of the world's total lumber. It also produces more than one-third of the wood pulp in the world. Together, the United States and Canada produce nearly half the world's supply of newsprint. 4) Men were sent out by the British Navy to mark the tallest trees of the colonial forests with the sign of a broad arrow. This meant that they were for the king. Any settler who cut down or damaged a marked tree received the death sentence.